Developing a nutrient management plan depends on testing manure for nutrient content. Your manure test results are only as good as your sample. This page outlines recommended ways to sample solid manure from open feedlots. 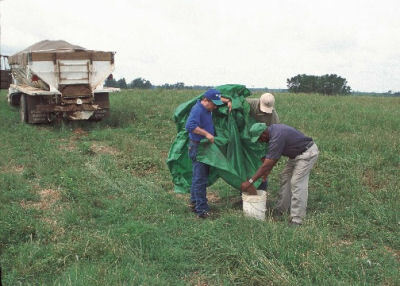 The recommended sampling for solid manure is to sample while loading the spreader. 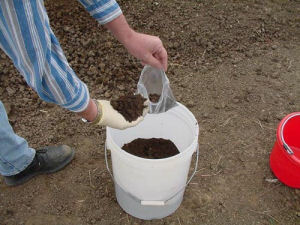 Sampling the manure pack in a barn directly has been shown to result in very variable results and is not recommended. Take at least 5 samples during the process of loading several spreader loads and save them in a bucket. When all of the samples are collected, thoroughly mix the samples and take a subsample from this to fill the lab manure test container. Spread a tarp or sheet of plastic in the field and spread manure over this with the manure spreader. Do this in several locations and with several loads of manure. Collect the manure from the tarp or plastic sheet in a bucket. Mix the manure collected from different locations and spreaders, and take a subsample from this to fill the lab manure test container. This procedure is usually only practical for more solid manures. Place a 5 gallon bucket under the barn cleaner 4 or 5 times while loading the spreader. When all of the samples are collected, thoroughly mix the samples and take a subsample from this to fill the lab manure test container. Repeat this several times throughout the year to determine variability over time. Collect 8-10 samples from throughout the house to the depth of the litter to be removed. Samples near feeders and waterers can be very different. Collect samples from these areas proportional to the space they occupy in the house. When all of the samples are collected, thoroughly mix the samples and take a subsample from this to fill the lab manure test container. A sample taken while loading the spreader or during spreading is likely to be a more representative sample. 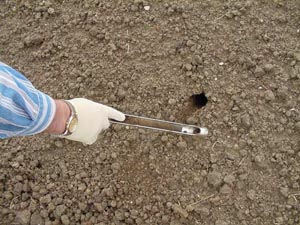 Take 10 samples from different locations around the pile at least 18 inches below the surface. When all of the samples are collected, thoroughly mix the samples and take a subsample from this to fill the lab manure test container. Large diameter auger bit and portable drill or soil sampler can be used to access manure deep within pile. These videos were produced by the Iowa Learning Farms project.